Sam Coltherd and Galaxy are heading to the International Exchange Pony Club Games as part of the GB Team. Racing returns to Kelso on Monday for the popular Buccleuch Cup Day, when Casenove Capital Management sponsor the prestigious maiden hunter chase for the third year. Sixteen-year-old Selkirk jockey Sam Coltherd – victorious on the point-to-point circuit on Easter Monday – has already finished runner-up in a hunter chase at the track with Darsi Dancer, while another possible contender is Kalastar – the winner of his last two points across the river at Friars Haugh for Galashiels handler Sylvia Scott. New Kelso sponsors Psigma Investment Management back the handicap chase run for the Haddington Jubilee Cup. “It is just the sort of local event I am keen to be associated with,” explained senior investment director Tim Wishart. 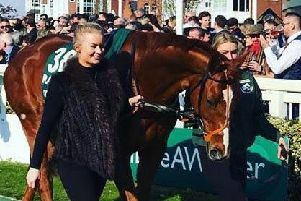 Pauline Robson plans to run Newcastle victor Habbie Simpson, owned by racecourse steward Sandy Love, while East Lothian owner Ray Green could be represented by January Musselburgh winner Full Jack. The second race is sponsored by Peter Wight and John Cockburn, in memory of Grantshouse trainer Stewart Wight, who sent out over 1,000 winners and was leading National Hunt trainer in the 1952/53 season. September Perth scorer Claragh Native has had a mid-winter break and trainer Martin Todhunter is considering this opening. Another new sponsor is John Manners, who presents a trophy in honour of his father’s prolific winning flat horse La Garcon D’or, while Ambleside-based David and Nicky Robinson sponsor a competitive 2m 6f handicap hurdle race. Chirnside financial advisor, Douglas Pryde, sponsors a race in memory of his great friend Duncan Sinclair in which Keith Reveley’s Dance Of Time, who ran in the Champion Bumper last spring, could run for the first time over hurdles. Racing comes under orders at 2pm.